The Bodnant Estate, a National Trust property, is a strikingly beautiful agricultural estate in North Wales. Set in hilly and wooded countryside in the lower reaches of the Conwy Valley, it commands spectacular views across to Snowdonia. Stone cottages and farm buildings have been restored using traditional materials and techniques, and the Estate supports farming and encourages other rural activities. With intimate corners, sweeping lawns, grand terraces and verdant woodland, huge crowds are drawn to Bodnant all year round to soak up the beautiful sights. It is for this reason that John is extremely selective about which equipment he uses to maintain the estate. “Visitors’ enjoyment is our first priority so our machinery is picked as much for noise levels as it is for performance. 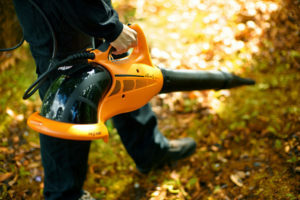 As John says, the Pellenc Airion is extremely silent throughout operation with an intensity level of just 79db – perfect for sensitive areas such as Bodnant. Furthermore, the Arion stays perfectly balanced during operation, regardless of the speed – which can be altered depending on the task required. With a 4 speed setting it is possible to manage the blowing power based on the surface to be cleared. Weighing only 2.55 kg it is extremely lightweight and is the only battery powered blower on the market with a powerful thrust of 17.5 newtons. It is also waterproof to IP54 standards and is protected from dust and moisture. As with all Pellenc equipment, operators can expect a full day’s work from the lithium-ion battery. With over 10 years of experience and the world’s first manufacturer to introduce this technology in professional hand-held power tools, Pellenc’s range of batteries have gained world-wide market recognition. The batteries are adaptable to all tools in the Pellenc range and are guaranteed emissions-free, meaning that operators will be contributing to reducing the consumption of fossil fuels while still increasing their productivity – something that John has certainly noticed with his Airion. Light, odourless, noise-free, with no starting problems and no filling the fuel tank – it’s no wonder more and more people are turning to the innovative technology of Pellenc.